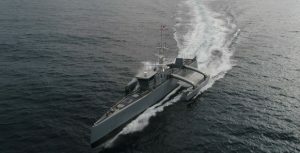 This new USV concept is part of the Navy’s goal to increase networking and interoperability of each of its ships. During future missions, large manned ships could act as passive command and control centers – while USVs could handle sensing and electronic warfare. The first USVs to set sail will have military personnel onboard as an initial precaution. Both the Navy and the Coast Guard will need to build trust in these new ships since air and land have been the only hallmark venues of unmanned platforms. This is a pivotal time in history for maritime operations because situational awareness, flexibility and control are becoming increasingly important when dealing with competing countries. And while USVs are an exciting development, they’re just one part of the Navy’s innovative tactical network. In fact, we’re working with a US-based prime system integrator on another Navy project. It’s our largest contract in the last decade. While exact details are classified, we’ll provide high-power, X-band, pulsed traveling wave tube amplifiers (TWTAs) for a shipboard program. To ensure the TWTAs stay reliable while at sea even in the most rugged conditions, each one will undergo extensive environmental testing at our Silicon Valley facility. We’re one of the few OEMs and specialized contract manufacturers to have HALT/HASS machines onsite and a dedicated potting/encapsulation laboratory. So when products leave our facility, they’ve proven their reliability while meeting critical size, weight and power (SWaP) requirements. As this new wave of unmanned vessels comes to life, we’ll continue our service on the manufacturing frontlines to help ensure smooth sailing for all the military operations we’re part of.